Instructions: Go outside after sunset and look up. If you do so not long after dark, and you face east, you’ll see three bright stars making a big triangle high in the sky. The brightest star, at the top of the triangle, will be almost directly overhead. This is Vega, in the constellation Lyra. Down and to the left of Vega is Deneb, in Cygnus (off to the northeast if you’re facing east). Down and to the right is Altair, in Aquila. Vega, Deneb, and Altair make up an informal grouping known as the Summer Triangle. If you live under a lot of light pollution–like I do–you’ll have no problem finding the Summer Triangle because the three stars will be pretty lonely up there. Even if you’re fortunate enough to live under dark skies, the Summer Triangle is easy to spot because its members are so much brighter than anything else in the area. 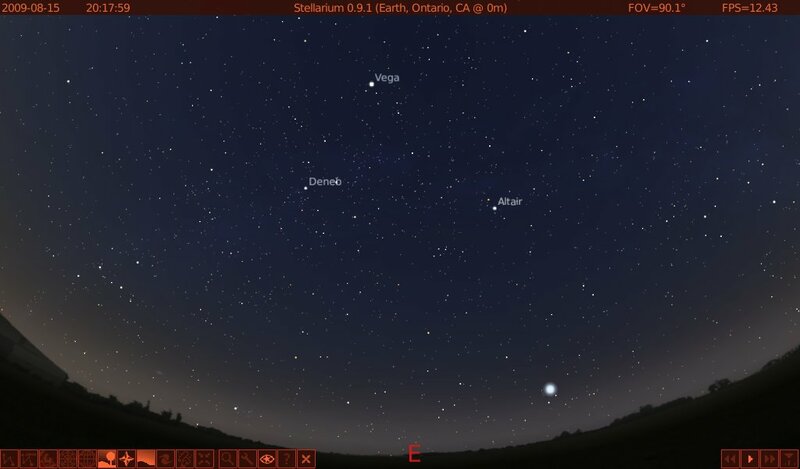 The Summer Triangle in Stellarium. Click to enlarge. To get both the Summer Triangle and the horizon in the same shot in Stellarium, I had to zoom out a lot, which introduced some fish-eye distortion. This makes it look like a cozy little polygon high up in the sky. It’s not! When Vega is high overhead, Deneb and Altair are still climbing the eastern sky, and the whole triangle takes up a huge swath of cosmic real estate. Two more things about the picture above. You can just make out the Milky Way as a band of faint light cutting across the triangle from north to south. The whole area is packed with star clouds and other deep-sky goodies for binoculars and telescopes. And the very bright light near the southeastern horizon is Jupiter, the king of the planets, just rising to begin his stately progression across the southern sky. But those are missions for other evenings. You are currently browsing the 10 Minute Astronomy blog archives for the day Sunday, August 16th, 2009.